Photos published by Expreview confirm AMD is planning one more rebrand to target the gap between the GeForce GTX 960 and GeForce GTX 970. 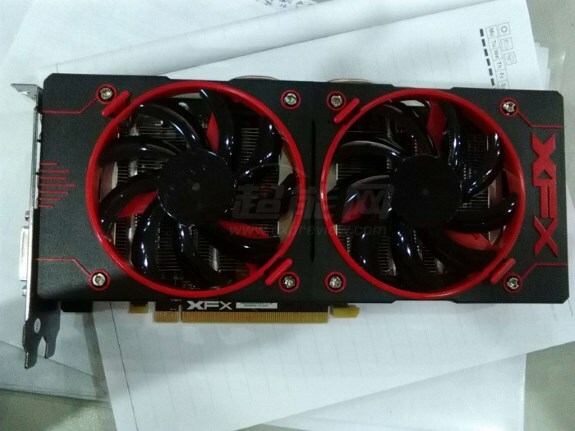 This will be the Radeon R9 380X, a card believed to be based on the 28nm Tonga GPU with GCN1.2 architecture. Exact specifications are still a mystery but it's believed the card will have the full Tonga with 2048 stream processors, 32 compute units, 128 TMUs, 32 ROPs and perhaps a 384-bit memory bus with 3GB or 6GB of GDDR5 memory. Another equally plausible theory pins the R9 380X as a chip with 2,048 stream processors, but the same 256-bit GDDR5 memory interface of the R9 380, with 4 GB of memory, letting AMD keep the costs low. XFX appears to be ready with a "Double Dissipation" card based on the R9 380X. The card's new-generation Double Dissipation cooler features an aluminium fin-stack heatsink with four 8 mm thick nickel-plated copper heat pipes, and a pair of 100 mm spinners, which are easily detachable, letting you clean the heatsink underneath. Mass-production of the R9 380X is reportedly underway, so a launch is to be expected rather soon.